Radar sensors help keep road users safe. With each stage on the way to fully autonomous driving, the number of radar sensors per vehicle rises significantly. Both OEMs and Tier 1 suppliers need reliable test solutions, suitable for mass production, for the large number of safety-related radar-based driver assistance systems. Rohde & Schwarz developed the new R&S AREG100A automotive radar echo generator in close cooperation with the automotive industry. The company put its decades of experience in millimetrewave technology into designing a test and measurement product precisely tailored to the automotive industry's test requirements. Continuous quality control in production is essential to ensure the unrestricted functionality of radar sensors, and ultimately safe autonomous driving. The R&S AREG100A is a customised solution for use at the end of the production line. It fullfills all requirements for reliable operation and is easy to operate. It tests radar sensors in the 24 GHz ISM band and in the E band at 77 GHz or 79 GHz. It simulates echoes of up to four artificial target objects at fixed distances. User-configurable Doppler offsets can optionally be applied to simulate radial movement of the objects. Customers can specify desired fixed distances at the time of order. It supports bandwidths up to 4 GHz in the E band and can simulate objects at a minimum distance of 4m if the distance between the frontend and the DUT is 80cm. 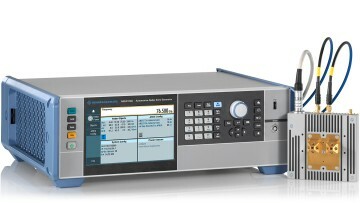 For cost-optimised execution of the tests specified in the RED standard ETSI EN 303396, the R&S AREG100A provides calibrated input and output ports in the IF band. The immunity of the sensors to interference signals can be checked with a connected RF signal generator. The occupied bandwidth and spurious emissions can be measured with a connected signal and spectrum analyser.